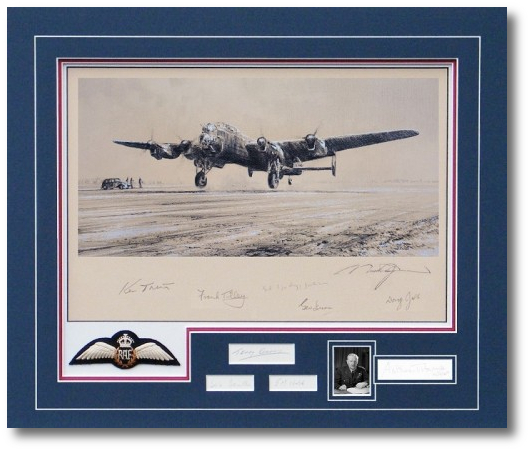 The 17-signature Bomber Command Tribute Edition is issued with this specially commissioned original pencil drawing by Robert Taylor which has been signed by five highly distinguished veterans who flew with RAF Bomber Command during WWII. Each drawing is conservation matted to include the original signatures of a further four famous Bomber Command veterans, including its legendary Commander in Chief, Arthur �Bomber� Harris. Overall size: 30 3/4" x 23 1/2"
With these words the British Prime Minister reminded the House of Commons of the heroic role undertaken by the young men of RAF Bomber Command during World War II as they set out across the North Sea to wreak havoc upon the enemy. And the cost they bore � for the odds of a safe return were, at best, marginal. One aircraft above all came to symbolise the valiant deeds that these young men undertook � the mighty Avro Lancaster. Introduced in early 1942, it quickly became the backbone of Bomber Command and it wasn�t long before a score of airfields across the east of England reverberated to the sound of its four mighty Merlin engines. Almost Home recreates a scene that was familiar to anyone in Bomber Command. A lone 9 Squadron Lancaster, separated from the main force during a punishing mission to Germany in late 1944, returns to safety. The weary crew are no doubt relieved to see familiar fields beneath them as they approach their base at RAF Bardney. 9 Squadron had received their Lancasters in September 1942 and became a leading unit within Bomber Command. Working on operations alongside 617 Squadron, they specialised in dropping Barnes Wallis�s famous 12,000lb �Tallboy� bombs, including the successful mission to sink the German battleship Tirpitz. 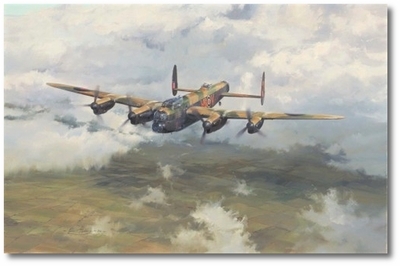 This previously unreleased work was commissioned by a crew member of the featured Lancaster in 1984, the decade that saw artist Robert Taylor shoot to international renown as the world�s most widely collected aviation artist. A timeless and poignant classic, Almost Home has been selected from the Military Gallery Archives to commemorate the Centenary of the Royal Air Force. The world�s oldest independent air force, the RAF was formed towards the end of WWI on 1 April 1918, when the Royal Flying Corps and the Royal Naval Air Service merged to create what was then the largest air force in the world. Since then the RAF has played a significant role in British military history. With original drawing and seventeen signatures! The signatories included in this edition flew a staggering 681 bombing missions between them! "Approach to the M�hne Dam"